Did you bother actually reading the error message? It's pretty verbose: gwinAttachMouse() is a deprecated call. You don't need to call it yourself manually anymore. Just remove that call from your application code and you'll be ready to go. The problem is gwinAttachMouse() is called nowhere in my code. The error is complaining the deprecated attribution doesn't take argument while a message is passed as an argument in gwin_widget.c and gwin_widget.h. // This is now a NULL event because we automatically attach to all mice in the system. Can you please tell us which compiler you're using? Also, are you trying to compile a demo or example project? This project is a tryout to run uGFX on FREERTOS + HY-miniSTM32 (STM32F103VC) board. The base is a FREERTOS demo for HY-miniSTM32 board based on Standard Peripheral Lib. I revised the LCD and Touchscreen driver example codes provided in the uGFX package because the Standard Peripheral Lib is used. By following the instructions provided in the document, there is no problem to integrated uGFX to FREERTOS except the issue of deprecated attribute. 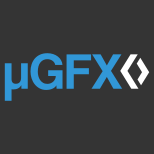 Task4: a uGFX button widget. If the button is pressed, the screen rotates 90 degree. This code is leveraged from a STM32F4 uGFX example. Now the whole project is working fine as long as the deprecated attribute changed to no argument as mentioned earlier. Can you please give us the exact version of the Keil compiler, and whether you are using it in ARMCC compile mode (the default) or GCC compiler mode. It will display a warning about what it auto-detected the compiler as. This will help us track down what is causing the incompatibility.